Pacific Great Blue Heron Population and Monitoring, Vancouver Island and the Gulf Islands, 2013 – 2015, including our own Cowichan Bay herons. Join the Coastal Waterbird Survey and learn how to identify local birds. Everyone is welcome! The Cowichan Estuary Nature Centre participates in the Bird Studies Canada Coastal Waterbird Survey. 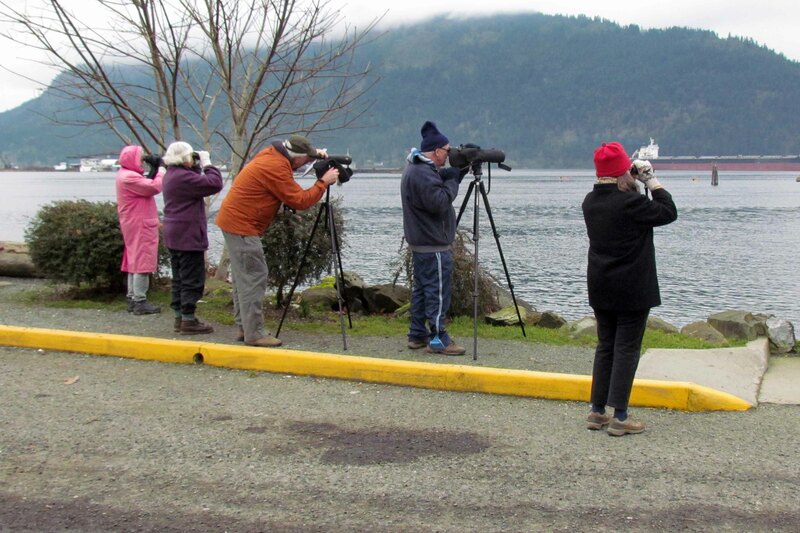 On the second Sunday of each month, at or near high tide, teams of volunteers spot, identify, and count waterbirds on a measured section of Cowichan Bay shoreline. Skilled and experienced birders lead the count, but everyone is welcome to come along. It is a great opportunity to learn more about the birds in the estuary and hone your birding skills. Bring binoculars and dress for the weather. Counts take place on the second Sunday of each month, with the time being determined by the time of high tide. Check the Coming Events page for the date and time of the next Coastal Waterbird Count. Since the Nature Centre opened in April 2012, these birds have been seen and identified by observers in Hecate Park — the boat launch to the Nature Centre to the Viewing Tower to the Kayak Park. If you see any birds that are not on the list, tell us about it using the contact form. The ID numbers are from the Checklist of the American Birding Association. The scientific names are very useful if you want to look up the birds on the internet. Special thanks to Derrick Marvin, Genevieve Singleton, and Brian Thompson who contributed many of these sightings, and to Ian Cruickshank for the most recent addition, a Hutton’s Vireo.